John Deere’s award winning apprenticeship programme has raised the bar yet again, setting another record for the new training season’s intake for the fourth year running since Babcock took over delivery of the courses in autumn 2010. Altogether 59 young apprentices – up by three on last year – have signed up to begin their first year of training in the work-based programmes. The latest intake includes 40 Ag Tech apprentice engineering technicians, 12 Parts Tech and seven Turf Tech technicians. 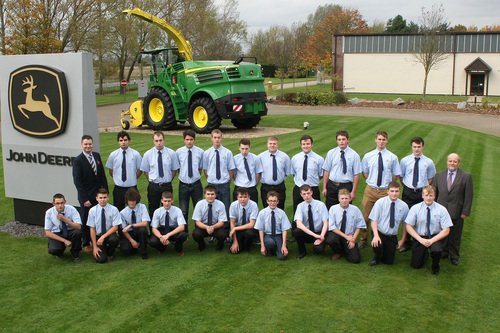 John Deere’s apprenticeship scheme was the first land-based agricultural and turf machinery programme to deliver training in the workplace, at the sponsoring dealership, with assessment and guidance from Babcock’s team of expert learning advisers. Additional training takes place at Babcock’s purpose-built training facility at Ruddington and the John Deere Training Centre at Langar, both near Nottingham. Overall the John Deere apprenticeship programmes, which also include Customer Service Tech, offer an IMI (Institute of the Motor Industry, the apprenticeship programme’s awarding body) VCQ level 3 land-based engineering qualification, IMI VCQ level 3 parts operations qualification or IMI VCQ level 2 customer service qualification. In addition, completion of the John Deere Ag Tech or Turf Tech apprenticeship is recognised by the industry’s LTA (Landbased Technician Accreditation) scheme at level 2. Graduating apprentices can then complete three free courses to gain the John Deere Diploma and start their adult training at the John Deere University (JDU), using the knowledge and skills gained from their initial one-, two- or three-year apprenticeship. After additional training and experience, they can ultimately go on to achieve the highest possible LTA4 Master Technician accreditation. Now in its 23rd year, Ag Tech was the first such scheme to be introduced in the UK and won a National Training Award at the end of 1997, the only one ever made to an agricultural machinery apprenticeship programme. Since the first programme started in 1992, more than 570apprentices have graduated through all the training programmes and been employed in the company’s nationwide dealer network.